We are still receiving compliments about your work in our kitchen. We want to thank you very much, as people are still commenting about the work after over a year. It's the best money we have spent in some time. Dear Dave: We haven't taken the time to express our thanks to you for the wonderful Remodeling job you accomplished in our home. We have been so thrilled with the results and have enjoyed so much the beauty and functionality of our kitchen that we must have forgotten our manners in not thanking you sooner. So many of our family and friends have been amazed with the transformation of the kitchen Area that they can't believe it was accomplished in such a short time. While we are still trying to find out where we have put things with all the cabinet space, we just plain love it all. Lee Ann still Wanders about the kitchen in the middle of the night and beams with pride when she shows it to her friends during the day. We have had so many compliments that reinforce our decision to have you do the work. 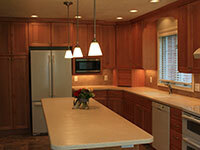 While many see the cabinets, lights and re-arrangement of appliances, we take pride in telling them about the floor. With numerous family gatherings and reunions this past month, the floor has been the bright spot in keeping things looking new and beautiful. The bar, for the first time, is big enough for a large group to sit around it. It has really become "the gathering place" in the house. Can you tell we are happy campers? We hope that from our "show and tell" episodes with our friends and neighbors, you will get more business. We are proud to tell them who did the work and the speed with which it was accomplished. Thanks again Dave to you and your workers. Oh and by the way, the flowers were a very nice touch. When I first heard of 3 Day Kitchen & Bath, I thought, "There's no way they could do a good job in three days - they must carry only the plain Jane cabinets, counter tops and flooring. Then you came to our house and we found out that you offered top quality materials and tons of choices and lots of custom options. 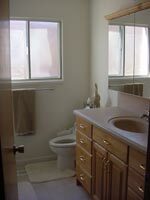 You worked with us to design a bathroom that was perfect for our family. 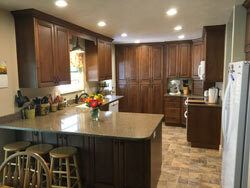 The installation was clean, thorough and professional - and you were done in just three days! The bathroom is beautiful. We love our kitchen and bath. It is so fun to have so much convenience in such a small space. All of our neighbors can't believe that you were able to complete the job in such a short time. Many say, "In that fast of a time did you really get good quality workmanship?" Of course, the answer is come and see for yourself! They are amazed at the beauty and convenience of the kitchen, we are also. It is really great to have so many electrical outlets. No more extension cords running across the counter. And the counter top is so easy to keep clean. We are sorry now that we didn't remodel sooner. The new bathroom is a thing of beauty. 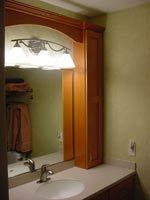 The new 3 way mirror, the shower stall, it is hard to believe that it all fit in that old 2x4 bathroom space. 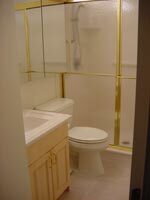 The elegance and convenience the bathroom gives to two old people with bad knees cannot be imagined. We want to take this opportunity to also thank the crew that came to do the job. They were always courteous and helpful to us. We never had to worry once about the care of our home while we were away. And what a great surprise to come home after the construction and find that everything was ready for us to move in and use. 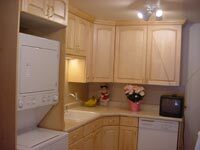 All the new appliances were installed and working well. And what a surprise to find new matching towels hanging on the towel racks in the bathroom. Thanks again for your great work. The other night we had a large gathering with 38 people in attendance. 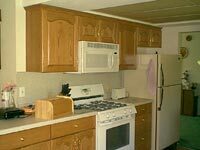 My new kitchen design facilitated the feeding of that many people. On top of that it with the new design and materials it was so easy to clean up afterward. This is my new kitchen, and I love it! 3 Day Kitchen & Bath did it on time, even though they had to re-arrange the whole kitchen so that I could have a new dishwasher. I especially like the new sink, which has no ridges or edges to clean.